SOLD INDIVIDUALLY. #6-32 x 3/8-inch Phillips head machine-thread (MS) screw. Pan head, steel, zinc finish. 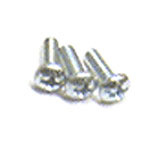 Commonly used on flipper bushings, coil brackets, playfield parts mounting, and many other parts in most games. Keep a few on hand for quick repairs! Replaces Bally/Williams #s 4006-01005-06, 4006-01027-06, 4106-01013-06. Can be used as replacement for Data East/Sega/Stern # 232-0007-02, 232-5202-00, 237-5501-00, and others.